Absco single garages can be used for a variety of purposes, as a workshop, to garage your car or boat or as an entertainment area. 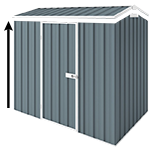 Absco provides high-quality Australian made workshops and sheds, which are manufactured, from Australian made BlueScope Steel. The all-steel structure also means their buildings are strong, versatile, weatherproof and easy to maintain. Our single garage sheds can be used for a variety of purposes, as a workshop, storage for your car, boat or as an entertainment area. This garage has W41N3 non-cyclonic wind rating. Engineered to withstand winds of up to 180km/h. For permanent secure installation of your garden shed, it is recommended to use anchors. These are considered by the industry workshop buildings or 'garage sheds' not a certified garage, however, you can choose to store your cars in it. These garages are manufactured to orders and the manufacturing can take up to 2 weeks. Skylight Sheet for Garages (1900mm x 750mm) - To let natural light in to your shed.